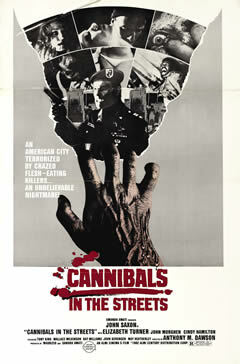 Tag line: "In the jungle, or in the the city, still they must EAT!" Right out of the gate, when we're thrown into the middle of a military rescue operation in Vietnam, Cannibal Apocalypse promises to be a very entertaining movie, and it's a promise the film certainly delivers on. Norman Hopper (John Saxon) is a Vietnam veteran who’s having nightmares about his wartime experiences. More specifically, he’s been dreaming about a rescue mission he led to recover two of his men, Sgt. Charles Bukowski (Giovanni Lombardo Radice) and Tommy (Tony King), who’d been captured by the enemy. The mission was a success, but something happened to the men while they were in captivity. When Hopper and his troops finally located Bukowski and Tommy, the two were devouring a recently killed Vietnamese woman, and Tommy, in a fit of rage, ran over and bit Hopper on the arm. Now married and living in a suburban Atlanta neighborhood, Hopper can’t shake the memory of this mission, or ignore the fact that, ever since then, he himself has been fighting the urge to take a bite out of the people around him. When Hopper learns that Bukowski, recently released from a Veteran’s hospital, bit the neck of a young girl in a movie theater, he decides its time to find the answers to the questions he’s avoided asking for years. There are plenty of gory shocks throughout Cannibal Apocalypse, with cannibalism treated as a contagious disease transmitted by way of a bite from the infected. At one point, Hopper finds himself alone with a young neighbor girl named Mary (Cinzia de Carolis), who's been flirting with him. Unable to control his urges any longer, Hopper stares into Mary’s eyes, lifts the young girl’s shirt…and bites her on the stomach! It’s a quick U-turn from where we assumed the scene was heading, and a rather humorous way to kick off the epidemic. Where Mary is the first victim, over time more people will become infected, and before long this ‘isolated’ illness is spreading at an alarming rate. While fitting neatly into the horror genre, Cannibal Apocalypse also boasts some impressive action sequences. Aside form the opening scene, which covers the battle that led to Bukowski’s and Tommy’s rescue, director Margheriti throws in some car chases, fist fights, and even a dramatic stand-off with the Atlanta police department. Not to be outdone, the film's climax is equally as thrilling; a chase through the sewers, where the police hope to finally close in on the escaped cannibals. It’s moments like this that keep Cannibal Apocalypse flowing along at a brisk, almost break-neck pace, a pace it maintains effectively throughout. Nice short review. That is one of those movies that I will end up watching someday because my interest will become too strong. Adam: Thanks! This was written back when I thought I "needed" to be brief in order to accomplish this 2,500 movies task! I've gone back and expanded on some of these earlier entries, and will certainly have to do so for this one as well. Glad you enjoyed it, but it's far TOO brief, in my opinion! As for the movie, it's a great bit of exploitation, and a lot of fun.